HaitiRozo: Loyola Graduate Singer and Songwriter Riva Précil's Band Bohio Music Releases Its First Single Song titled "1492"
Loyola Graduate Singer and Songwriter Riva Précil's Band Bohio Music Releases Its First Single Song titled "1492"
Photo from Riva Précil's Facebook page. 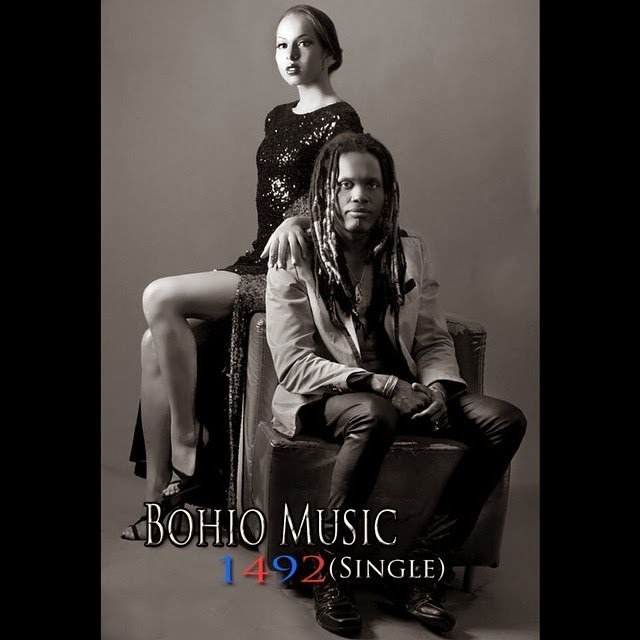 Bohio Music releases first single “1492” -- an upbeat World music song in Haitian Creole incorporating traditional Haitian roots/racine, jazz, Ibo rhythms with a Mali influence. August 5, 2014, Brooklyn, New York – Monvelyno Alexis and lead singer, Riva Nyri Précil, of the recently formed Bohio Music band, are pleased to announce the release of their first single. Written by Alexis, 1492, a 5.25 minute single, is an upbeat World music song in Haitian Creole encompassing Haitian roots/racine, West African Ibo rhythms and infused with jazz and a Mali influence. 1492 is a powerful anthem that will move its audience to jump up and dance as it recounts the history of Haiti's colonization and calls out loudly for renewed sovereignty of Haiti today. See 1492 on CDBaby.com See English translation of 1492. The song’s release is timely as Haiti celebrates Bwa Kayiman, the anniversary of the birth of its slave uprising in 1791 that successfully freed Haiti from French rule and slavery in 1804. And, very shortly, the United Nations Security Council will once again vote on whether to continue its controversial peacekeeping mission in Haiti that many Haitians look upon as an occupying force that also brought the deadly disease, Cholera, to Haiti. Bohio Music’s 1492 calls on Haitians for renewed hope, strength and mobilization. Currently based in Brooklyn, New York, both Alexis and Précil grew up in Haiti during a hopeful time. Following the overthrow of the Duvalier dictatorship, Haiti’s vibrant democracy movement blossomed permitting the flourishing of uncensored arts and music. Both Alexis and Précil enriched themselves studying the diverse arts and culture of Haiti. Monvelyno Alexis, an acoustic guitar player, singer/songwriter, as well as an artist, originally performed with the prominent Haitian Vodou-rock band, RAM, in Haiti, and has several albums under his belt, including Kouzen Azakamede, Conscience State of Mind, and Nou La together with Markus Schwartz. Most recently Alexis sang three songs on the soundtrack of Assassin’s Creed, the Ubisoft game that sold more than 73 millions copies by the end of 2013. Riva Nyri Précil is a singer, songwriter, dancer, jeweler and author of a forthcoming children’s book in Haitian Creole. Précil attended New York City’s Fiorello H. LaGuardia High School of Music & Art and Performing Arts and earned her degree in Music Therapy at Loyola University in New Orleans. Please contact Michelle Karshan Communications at Michelle.Karshan@gmail.com for additional info, high-resolution images, interviews, etc.